Established in the year 1977, we Rughani Brothers, are known among our customers for manufacturing, supplying and exporting the best quality of Suiting & Shirting Fabrics. Inclusive of Suiting Fabrics, Shirting Fabrics and Ready Made Garments & Apparels, we offer a wide range of products. The offered suiting & shirting fabrics are highly demanded in garment manufacturing industries. Due to their smooth texture, fine finish, elegant appearance, trendy design and vibrant color combination, these suiting and shirting fabrics are highly demanded. The offered suiting and shirting fabrics are designed from the finest quality of skin-friendly fabric yarns that are sourced from trusted and reliable vendors of industry. Offered by us at industry leading prices, these suiting and shirting fabrics are highly demanded among our customers. To meet the precise needs and expectation of our customers, we offer these suiting and shirting fabrics in various patterns, colors and sizes. Large production capacity of our state-of-the-art infrastructure has helped us in meeting the bulk demands of the offered Suiting & Shirting Fabrics. With the aid of our wide distribution network, we have been able to deliver the offered Suiting & Shirting Fabrics at the customers’ end within the assured time frame. Moreover, the offered Suiting & Shirting Fabrics are packed with standardized packaging, to ensure safe transportation. Mr. Ronaak Rughani is managing director of our company and he has helped us in catering to the precise requirements and expectation of our customers. He has helped us to attain huge clientele, owing to his excellent management skills and innovative ideas. Our infrastructure is divided into manufacturing, warehousing, packaging, in-house quality testing and sales & marketing unit. Spread over a wide range of land, our infrastructure is well-equipped with latest machinery required for carrying out large scale production. Quality focused and driven approach has helped us in providing our customers with the finest quality of shirting and suiting fabrics at cost effective prices. For carrying out different quality testing operations, we have appointed a team of skilled quality controllers, who hold expertise in their area of works. Participation of all employees and management as a team. We look for long-term relationships with customers, employers and suppliers in lieu of making each one of our stakeholders successful in partnership with us. 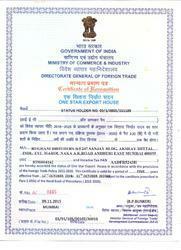 We Star Export House Certified Company. 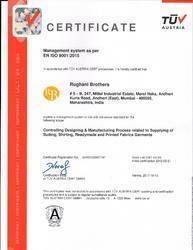 We receievd this Certificate from TUV Austria . We have been backed and supported by a team of innovative professionals, who hold expertise in their area of work. By training them through seminars and workshops, we enhance and polish their skills in the most efficient manner. Owing to their profound experience of this domain, they work in close coordination with each other to ensure a hassle-free work place. By catering to the ever-changing market trends, we have been able to attain a commendable position in this domain. Ability of manage the bulk demands within the assured time frame, has helped us in winning the trust of our valuable customers. To create innovation in textiles through aesthetics, comfort and performance. To be a supply chain partner offering an integrated textile solution to leading brands, wholesalers and retailers in the world. To be a global player in the business of fashion and textiles. Business Philosophy We seek to provide amicable and efficient integrated solutions to the essential needs of our customers. Our endeavor is to exceed customer satisfaction by understanding the customer's requirement and concerns by pursuit of the following: Being in close contact with the customers and getting their feedback Continuous innovation in product development to create superior aesthetics, comfort, performance, features and to provide customization Participation of all employees and management as a team. We look for long-term relationships with customers, employers and suppliers in lieu of making each one of our stakeholders successful in partnership with us.